The young Nats are right, climate change is not a political issue. It’s a survival issue – for everyone – and everyone needs to act. They have more brains than their elders – please hurry up and take over the party. Imagine if the National party became a real National party, rather than the corrupt, dairy-reaching, hollow-act, incompetent power-zombies they are now. At last, some (un)common sense from a National source – well past time for humans to cut the crap flowing into our only pool. Great move. Now if we can dislodge the current fossils from power it looks like cross-parliamentary support could prevail long enough to do the job. Wow, I’m sensing some awkward moments when the Young Nats meet up with their older brethren. Dang! One way to get members, excuse my cynical response. It appears they are changing their behaviour dramatically from last election. Is it survival of their favoured political party, or survival of all life on the planet? Would be good if they are sincere and are proactive in their claims, I’d like to give praise but their track record prevents me from doing so until I see real action from them. Climate change is very very real, and we can’t control the sun. Historic events and records along with current technology all point to a Grand Solar Minimum manifesting in our lifetime. It’s a good time to learn how to grow food. 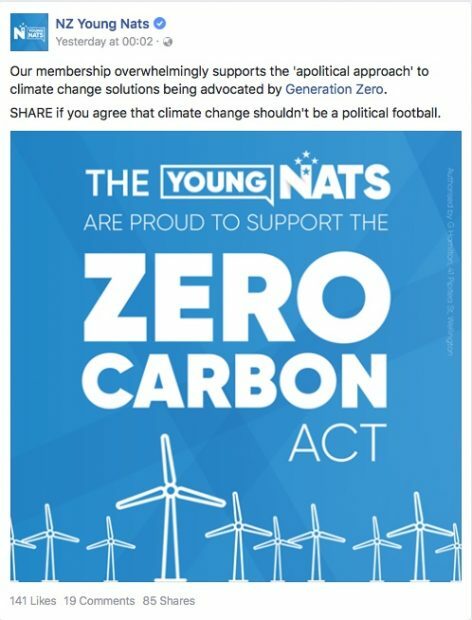 The Young Nats can see how vulnerable their party is to serious and valid criticism around their weak, irresponsible response to climate change and wish the issue to be “non-political” – I bet they do! I agree Robert, it can’t be a non-political issue as for the most part it concerns big $$$. And the Nat party is all about keeping the big $$$ in the pockets of their friends and enablers. Also the Nats are specialists at saying one thing and then either completely ignoring their promise or making the “cure” so weak/underfunded that the net result is statis quo. I don’t doubt the young Nats are following the same billshit formula as their idols in their party that they aspire to emulate. Under the Paris agreement the emission reduction targets are politically binding. The metric mechanisms for measurements ie the scientific calculations under full carbon accounting are legally binding. Biennial updates on all countries’ national greenhouse gas inventories “shall” be reported, according to Article 13, paragraph 4 of the Paris Agreement. However, according to World Resources Institute (WRI), some exceptions will be given to “the least developed countries (LDCs) and Small Island Developing States (SIDS), who will report at their discretion.” Under The Agreement, emission reduction targets are politically binding, but not legally binding. This shifts pressure toward the reporting and verification mechanisms embedded in The Agreement, which are legally binding. This is a fatal flaw in the Fletcher case,as is the transparency mechanism agreement which is still being negotiated and takes effect from 2020,and will include the updated scientific sink mechanisms. How funny young Nats are only concerned about climate change this close to an election, after 9 years of fake carbon credits, oil speculation and zero public transport or rail from their party. Nats can turn fish to faeces and fascists to friends. They have zero credibility on carbon or anything remotely environmental. If you truely believed in zero carbon emissions then you could not be a National supporter. As for generation Zero, they seem like a green washing organisation for property developers to me. Thinking that a PPP is a good idea and the public pay for the Sky bridge if you walk or cycle while trucks go for free??? That is National thinking through and through. The hypocrisy that will inevitably get worse as this campaign grows. The New Generation, are not as self centred as they were in the 90,s, let’s hope the young can be mobilised to vote this time round. The full report is in there. So the YoungNats as ever are just following on behind the grownups. It’s entirely possible that if National wins again – particularly if there is good coverage of the court case – that they simply endorse this report and start to really take emissions and climate change off the political table and in to common policy formation. Zero carbon = zero food, zero current lifestyle, zero cars, zero planes, zero humans. BM – no world has ever ended following predictions of doom? It’s happened time and time again throughout history. Now, we have a bigger story, where “the world” really does mean the whole globe, rather than the “known worlds” that have fallen. Why you think that world endings are unpredictable is a mystery to me. You find it amusing that people use their brains and try to shape their destinies while you sit in your comfy chair and watch and smile – and tell everyone what a waste of time they are. You are as deluded as Monty Python. Too little, too late. Stable door and all that. High hopes for the younger generation.